Today was the second local Georgia woodworkers event and we had a great time again. For this event Lamar set up a tour with the owner of CAG Lumber Steven Brown. When Lamar set up the tour to visit Steve’s mill I expected a large saw mill but when I arrived at the address typed into my GPS, there was nothing there. I asked a neighbor if she knew where the saw mill was and she said she didn’t know there was a saw mill around….I thought I was totally lost. I called Steve and he gave me directions on in the way guys back home in North Carolina give directions, second road on your left after the church at the mechanics sign. After arriving, Steve brought us up the hill to watch him slice up a Beach with his Wood-Mizer, wow that thing is awesome, I have watched this before but am still amazed at how easy the machine handles the logs. The first pass just cleans the bark off and makes a thin cut after that he can slice whatever thickness he wants with no binding. The first few boards cut are mainly 8/4″ but later Steve made a few cuts for mantle boards that where 4″ thick and the Wood-Mizer cut the boards with no strain at all, amazing to watch. Other than the Georgia heat the only part of the work that brought a sweat was when Steve had to change the blade, it is crazy to think that the blade on this saw cost pretty much the same as the blades on my own band saw in my shop! 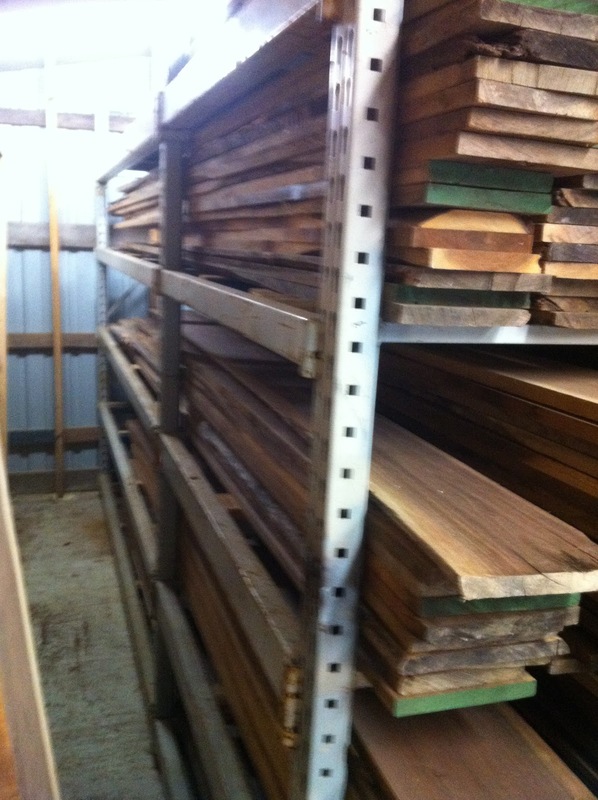 Next Steve brought us around to see his stored lumber, I must say that I was not expecting the stock pile that he had. He had rack after rack of Walnut, Cherry, Maple, Oak, Cedar and much more. He even pulled out a few pieces of his private one-of-these-days-I-will-build-something-with stash and has some beautiful and interesting stuff, like Sassafras (smells just like root-beer). Steve was a great host and we all really enjoyed the tour around his mill, he has a great stock of most any thing you want and can get just about anything else, and with great prices…plus he is just a nice guy. You can visit Steve online at http://caglumber.com. The past two events have allowed me to meet many great local woodworkers and I really hope we continue and grow to bring in even more woodworkers. Any others that are interested in joining our group let me know and I will add you to the e-mail list of events to come. Sounds great Bill and jump in there with the dovetail bowl! Yea, it looks like you and Trey caught the brunt of Phil's Photoshopping…. Aaron, I must say that I was pleasantly surprised by Steve and will be buying most of my wood from him in the future. He really does seem like a great guy. I am glad you brought Phil and Turtle, and I like Phil's Photoshopping… I like a little humor….even if it was a little morbid. Thanks Bill. I am glad you and Trey came out too. I am looking forward to doing it again. Do you already have a project in mind for the wood? Make sure you send me pictures. This was a great event, and Steve will be the first source I think of for my lumber. What a great setup and a friendly guy. I had a great time. Oh, and I should have warned you guys about Phil's photoshopping in advance. Yikes! Trey and I had a blast at CAG Saturday. I think our little Georgia group of wood workers have a great thing going and I hope we continue to meet like this. I can't wait to start working with the purchases I made at CAG. Phil, It was great to meet you and Turtle yesterday. Really glad you came out with Aaron. We plan on having more events and hope the both of you will come out again. Vic, yea I noticed you said that "we" live there. I actually like it in the desert myself but not sure my other half agrees. The tables were a nice design. I liked how they had a live edge for the top but elegant tapered legs. I have always liked mixing contrasting designs like that too. Thanks for sharing the pics and write-up. Here's a few pics I took.